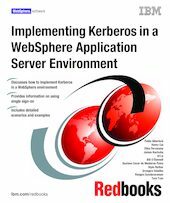 This IBM® Redbooks® publication discusses Kerberos technology with IBM WebSphere® Application Server V7.0.0.5 on distributed platforms. IBM WebSphere Application Server V7.0.0.5 Kerberos Authentication and single sign-on (SSO) features enable interoperability and identity propagation with other applications (such as .NET, DB2®, and others) that support the Kerberos authentication mechanism. With this feature, a user can log in once and then can access other applications that support Kerberos Authentication without having to log in a second time. It provides an SSO, end-to-end interoperability solution and preserves the original requester identity. This book provides a set of common examples and scenarios that demonstrate how to use the Kerberos with WebSphere Application Server. The scenarios include configuration information for WebSphere Application Server V7 when using a KDC from Microsoft®, AIX®, and z/OS® as well as considerations when using these products. The intended audience for this book is system administrators and developers who use IBM WebSphere Application Server V7 on distributed platforms.